Old Cotswold Legbar? What the heck is that? From Patagonia to Stow-on-the-Wold - what a journey! An "Old Cotswold Legbar" is a chicken. The hen lays her eggs in a variety of beautiful pastel colours including turquoise, blue, olive, pink, peach and eau-de-nil. The colours are perfectly natural and are akin to the eggs laid by many wild birds. They are proud, striking birds with distinctive "crests" and the hawk-like eyes of their earlier Chilean relatives. They can be traced back to the 1920s. Botanist and explorer, Mr. Clarence Elliott from Stow-on-the Wold in the Cotswolds, who toured the world collecting rare plants and animals, set sail for home in 1927 from Patagonia and amongst the many animals on board his "Noahs Ark" were three Chilean Araucana hens and a cockerel. Disaster struck when the cockerel was killed accidently but the three hens survived the trip. These hens were used at Cambridge University in genetic studies of poultry and by crossing these Araucana hens with White Leghorns and Gold Legbars, and over four generations, they produced the Cream Legbar. Direct descendants of these Cambridge Legbars are now kept on farms in the Cotswolds and have been instrumental in the development of Clarence Court's own bird - the Old Cotswold Legbar. 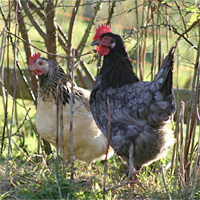 Clarence Court are donating 2p to HEN-Aid for every pack of Old Cotswold Legbar eggs sold until the end of September. Success for Chipping Sodbury in southern region of UK's most prestigious town community project award scheme. Submitted by Richard Newman on Mon, 24/09/2007 - 12:03. I buy my Old Cotswold Legbar eggs from Waitrose as I find the yolks and a deep colour which makes me think they are so much more healthy than other fowl, as for so many eggs one buys in the shops these days have rather anaemic yolks. I live near Chipenham and wondered if I could buy a cockerel and three hens from you please ? Submitted by Kent Stead on Sun, 03/08/2008 - 13:38. I am slowly expanding the small holding that I live on in Oxfordshire and would love to add a few blue laying hens to our flock. Do you sell your cotswold legbars and for how much. If not could you recommend someone who does? Submitted by caspar chan on Fri, 30/05/2008 - 06:05. Submitted by big aud on Fri, 17/10/2008 - 18:31.